The Milwaukee 0719 Cordless M28 Sawzall Reciprocating Saw uses a high powered Milwaukee built motor to deliver faster cutting and performance. Powering the 0719 is the revolutionary 28 Volt LITHIUM-ION battery pack, exclusively from Milwaukee. 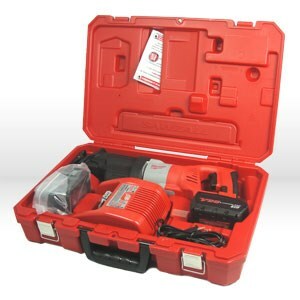 The 28 Volt battery pack delivers two times the run-time as most 18V products, making this the ideal solution in cordless reciprocating saws. The battery is positioned so that it does not interfere with plunge cutting capabilities. This Sawzall saw has a 1-1/8 in. stroke length that delivers speed. The variable speed trigger delivers two levels of speed range: 0-2000 spm for metal cutting and other hard materials and 0-3000 spm for cutting in wood and other materials encountered. The gear protecting clutch protects the tool against impact, delivering on the legendary Sawzall durability. The keyless shoe adjustment allows for better control in cutting and longer blade life. The QUIK-LOK blade clamp makes changing blades a snap. A comfortable non-slip soft grip handle provides a better gripping surface and reduces vibration and operator fatigue. Includes: M28 Sawzall Reciprocating Saw, Two Super Sawzall Blades, (2) 28V LITHIUM-ION Batteries (48-11-2830) and 1 Hour Charger (48-59-2819).